Cloud probes mounted under the wing of research aircraft collect measurements of relevant cloud droplet data by flying through the clouds. The new retrieval method developed by PNNL and colleagues give some of the same information from the ground as flying through clouds. Photo courtesy of ARM Climate Research Facility. Enlarge Image. What does a cloud scientist do when they can't visit every cloud to measure its properties? Make the cloud come to you! 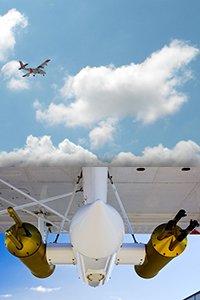 Scientists at Pacific Northwest National Laboratory (PNNL) got creative with the data they already have to calculate a cloud property normally acquired by research aircraft flying through it. What is this valuable measurement they seek? The cloud droplet number concentration provides insight into how reflective and long-lasting a cloud is. That measurement helps researchers calculate the amount of sunlight energy that hits Earth's surface—a measurement used to understand Earth's energy budget. Results: Scientists at PNNL devised a new retrieval method for cloud droplet number concentration by combining two surface remote-sensing measurements into one, enabling retrieval of continuous cloud droplet number concentration at cloud base. They used the surface measurements of the microwave radiometer and the multi-filter rotating shadow band radiometer. 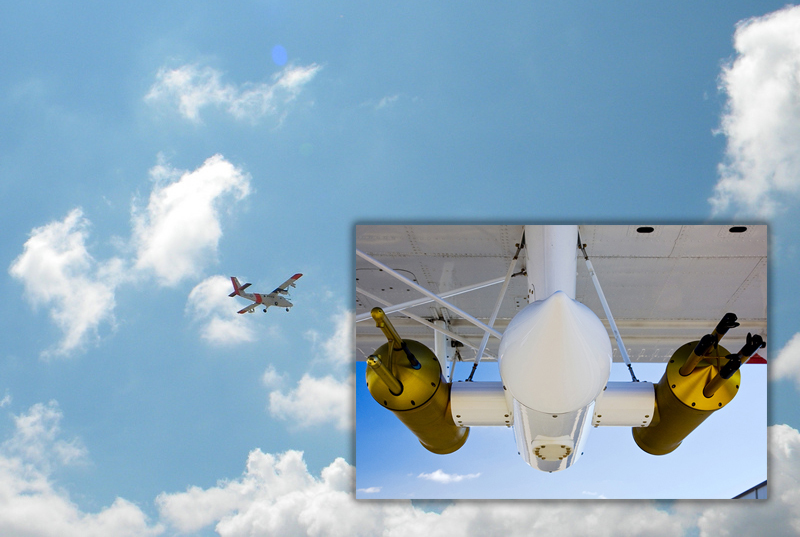 Collaborators at the University of Illinois contributed aircraft validation data so they could verify the approach by comparing the retrieval method with in situ aircraft data, measured by research aircraft flying through clouds. "Retrieval using surface measurements shows a comparable probability distribution with the directly measured in situ cloud droplet concentration from research aircraft." said Dr. Kyo-Sun Sunny Lim, atmospheric scientist at PNNL. "In addition, this new retrieval method, which can be produced over a long-term period, will help us understand the variability of midlatitude continental clouds and how aerosol particles affect low-level blanket-like stratus clouds over time," said co-author Dr. Laura Riihimaki, PNNL atmospheric scientist. Why It Matters: Flying through every cloud to take measurements isn't feasible. Long-term continuous observations of cloud properties, provided by instruments installed and managed by the Atmospheric Radiation Measurement (ARM) Climate Research Facility, a Department of Energy Office of Science user facility, are important to evaluate the performance of cloud calculations in weather and climate models and understand climate changes over time. Even though cloud properties can be directly observed from in situ airborne instruments, aircraft campaigns are costly and labor intensive, and are only available over limited regions during specific time periods. This study solved that problem by introducing a new set of instructions (a.k.a. algorithm) for calculating the cloud droplet number concentration in atmospheric models. Methods: The PNNL-led research team developed the new algorithm to retrieve cloud droplet number concentration at cloud base using the measurements from the surface remote sensors. The new retrieval algorithm has two major improvements: modification of liquid water path, which is an input of the retrieval algorithm, and the elimination of an adiabatic assumption (transfer of heat) in the retrieval method. They tested the new retrieval of cloud droplet number concentration from 13 years of surface remote sensor data (from January 1998 to January 2011) and evaluated the results against in situ aircraft data for the continental boundary layer clouds during the 2009 ARM Climate Research Facility field campaign, Routine AAF CLOWD Optical Radiative Observations (RACORO). The surface retrieval and the in situ aircraft data during the field campaign can be downloaded at the ARM Climate Research Facility Value-Added Products page and the RACORO campaign site. What's Next? This new method to calculate cloud droplet number concentration is only applicable for one cloud type: single-layered, overcast warm clouds. Researchers will develop an additional algorithm that can automatically categorize cloud types, such as cirrus, altocumulus, shallow cumulus, and stratus at the ARM Southern Great Plains site. Sponsors: The research was supported by the Department of Energy (DOE) Office of Science, Office of Biological and Environmental Research for the ARM Climate Research Facility, an Office of Science user facility. Research Team: Kyo-Sun Sunny Lim, Laura Riihimaki, Jennifer M. Comstock, Beat Schmid, Chitra Sivaraman, Yan Shi, PNNL; Greg M. McFarquhar, University of Illinois at Urbana-Champaign. User Facility: Data were obtained from the ARM Climate Research Facility. In one sentence: Scientists at PNNL and collaborators at University of Illinois at Urbana-Champaign devised a new retrieval method by combining two surface remote-sensing measurements into one, enabling retrieval of continuous cloud droplet number concentration at cloud base.